Flapjack is by far one of the most popular tray bakes in British food. Could be because they are so quick and easy to make and nutritious too. There are many, many styles of flapjack with almost any combination of nuts, seeds, fruit, and oatmeal bound together with golden syrup and a little butter. 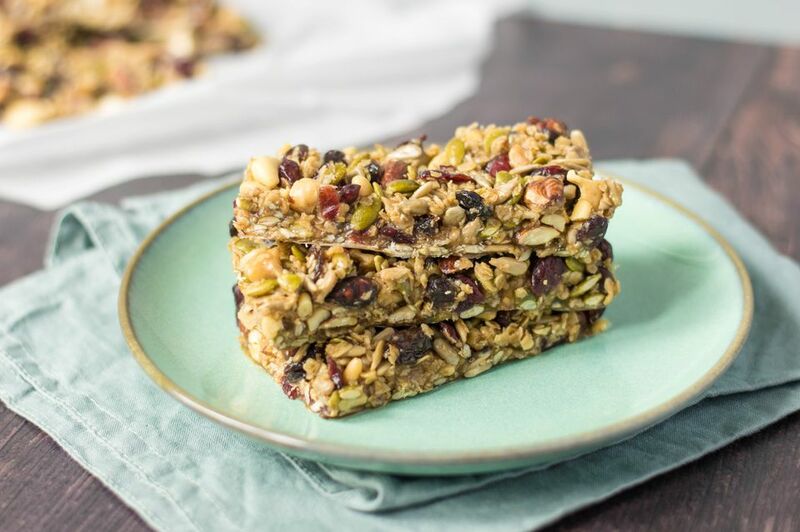 There is no baking in the oven, just a little stove-top cooking.This flapjack is muesli-based and contains a hefty dose of nuts, seeds, or fruit you like following the measures below which use volume (use a glass measuring jug) rather than weight. With this recipe you have creative freedom to create a flapjack with flavors which you like. Heat a large deep pan on the stove. Add the oats, nuts, and seed combination (do not add any fruit) and cook for 5 minutes, constantly stirring to toast the ingredients. Take care not to burn. The mixture should just be golden brown. Place the honey, dark brown sugar, and butter into a saucepan. Melt, these together on medium heat, to completely dissolve the sugar. Cook for a further 5 minutes on a low heat, again, taking care not to burn. Turn off the heat and keep to one side. Mix the toasted ingredients with the melted butter mixture and the fruit to form a stiffish dough. Grease an 8- x 8-inch square cake tin and line the bottom with a sheet of baking paper. Press the flapjack mixture firmly and evenly into the tin making sure to get into the corners. Cut out squares and rectangles in the flapjack, then place the tin in the fridge and leave for a couple of hours to set. The flapjack keeps well in an airtight tin. Mix dried apples, pears, and apricots (cut into small pieces) with the dried cranberries (making 1 cup altogether). Marmalade is another lovely addition to the bitter orange flavor. It does, however, have more sugar. Mix 1 cup desiccated coconut into flax, sesame, pumpkin and sunflower seeds (3 cups in total). If you want extra fiber, replace some of the seeds with a little wheat germ. Delicious Luxury Flapjack Recipe, You'll be Glad You Made it. Yorkshire Moggy Cake With No Cats Involved. Promise.